BigMelonCycling.com: Time to Register for Big Mel's Favorite Ride ... The Tour de Donut. Time to Register for Big Mel's Favorite Ride ... The Tour de Donut. Registration is now open for a ride that combines to of my favorite things to do ... (1)ride my bike and (2) eat donuts! I'm talking, of course, about the 2009 Tour de Donut in historic Staunton, Illinois along Old Route 66. This ride is sponsored by the Boeing Bicycle Club in St, Louis. The premise of this ride is simple. After a shotgun start; race 10 miles; stop, and eat as many donuts as you can; race 10 more miles; stop, and eat as many donuts as you can; race 10 more miles to the finish line! What could be better than that! The riders are timed, and for each donut you eat, you get five(5) minutes off your time. There are prizes for the fastest time, no donuts; the fastest 'donut adjusted time'; and the most donuts consumed. There are also various raffles. The fastest times are usually around 1hr 20 mins. ; the fastest adjusted times are always negative time; and the most donuts consumed has varied from 24 to 34!! The Godfather and I have been riding this ride since 2002. Okay, so I missed one year because I had a runny nose, but other than that I have completed this ride each year since 2002! In 2007, the Godfather and I rode a tandem and did quite well ... at getting out picture in the Springfield, Illinois newspaper (see above picture). 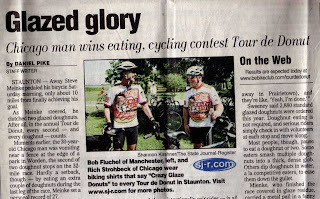 If you just look at the headline and read the caption under the picture, you would think I won the Tour de Donut that year. If you actually read the article, however, you would learn that another man from Chicago actually won the race (although there were pictures of him having a reversal which should be a disqualification). I received many calls from relatives in the area though congratulating me on my victory. Anyway, last year there were over 700 riders in the Tour and this year they are shooting for over 1,000! BigMelonCycling.com wants as many riders as possible to ride this year, so hopefully I can finish in the top half of participating riders! This years ride is Saturday, 11 July 2009 in Staunton, Illinois. To register click on the following link. Register today ... a smaller number on your jersey looks cooler! Come on and register, you know you want to! At least you can say you rode with Big Mel! As we get closer to the event, I will share some of my Tour de Donut secrets with you like how to smash and dunk. Check back ... you won't want to miss it.